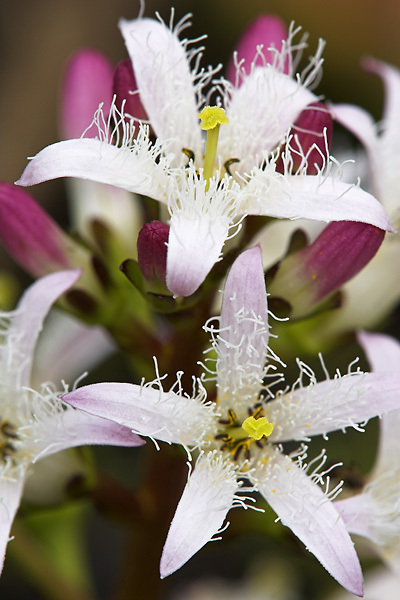 Menyanthes trifoliata L. A very attractive native marginal pond plant which does better in alkaline, unpolluted conditions. It is a good nectar source for early pond insects and bees. An emergent plant at the fringe of lakes or slowly flowing rivers. Also in pools and wet flushes. 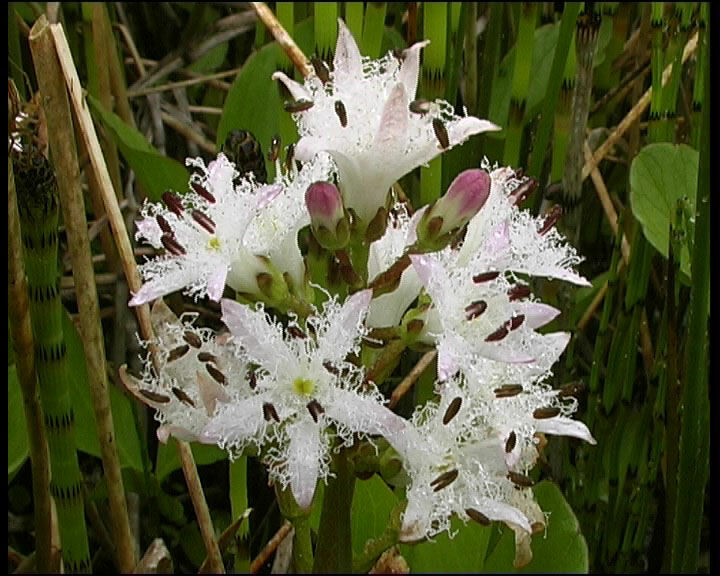 Pure stands of Bogbean can often be found where the emergent zone gives way to open water. It occurs over a wide range of soil types, from organic to inorganic, acidic to calcareous and over a wide range of nutrient levels. It can be found from sea-level to over 1000m.A perennial plant, losing its leaves over the winter. It may have floating rhizomes which grow out from the bank, sometimes forming a thick floating mat. It has very distinctive three-lobed leaves. The rhizomes are used medicinally in Ireland. This is an early flowering species, flowering from April through to July. The flowers are white, tinged with pink and are hairy inside. Like Primroses, they have two different kinds of flowers, pin and thrum, each produced on separate plants. These flowers differ in the length of the style, with pin eyed flowers having a long style and the thrum, a short style. This is an adaptation which ensures cross pollination by insects. The two different kinds of plants tend not to grow together. The pollen of thrum plants is less viable than that of pin plants. The seeds are dispersed by water. They float and can remain floating for up to 15 months. The seeds only germinate once the hard seed coat has been ruptured. Established colonies also spread vegetatively, by growth of the rhizome. They can eventually occupy very large areas of open water. Aquatic Plants in Britain and Ireland. C.D. Preston and J.M. Croft. Harley Books, 1997.